Villa Paola is a semi-detached holiday house with garden (1000 mq), in a historical renovated (2013) eighteenth century farmhouse. It is for 6 persons plus 2 extra beds (extra cost) and it is a bike friendly holiday house. It‘s located on the Berici hills, in the small town of Lonigo, unique view to the green surrounding. It is only 20 minutes from the city centre of Vicenza: city of Palladio (famous architect) that offers many tourist and cultural attractions. The accommodation is situated in a quiet and green scenery but it is easy to reach and near to the most important facilities. The interior is furnished in wood, the style is very warm and the walls are painted in various nice shades. It is very spacious: there are 4 bathrooms and 3 bedrooms. You have a garage, a nice and spacious shared porch, a shared living outdoor with oven for pizza and bread (cook on request). Ideal for exploring culture (monuments, churches, museums, exhibitions), wine and food lovers (possibility of wine tour and tastings) or simply for relaxing. The interesting surrounding area: Padua (a historical university town rich in culture, with works by Giotto), Vicenza (architecture and the Palladio villas), Venice (cultural, political and moral capital of the Veneto region, as well as a spectacular place to visit), Rosolina Mare, Jesolo, Caorle (sea and beach), Verona (Arena, Romeo and Juliette) and Lake Garda (beaches, surfing and amusement parks). 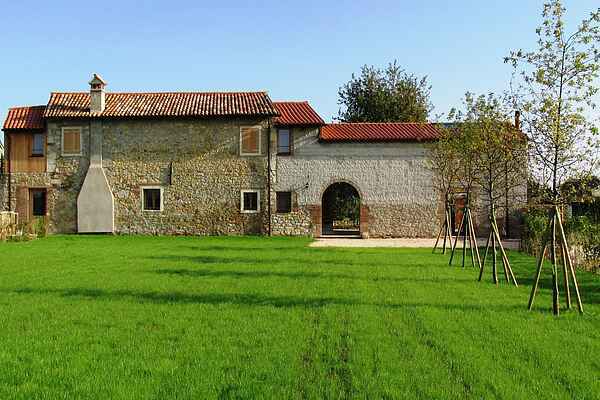 The art of Andrea Palladio in Lonigo http://www.visitpalladio.com/en/itineraries/statale-di-lonigo From Villa Paola to Gardaland (Peschiera) less than 1 hour by train. http://www.gardaland.it/park/index-en.php The interesting surrounding area: Padua (a historical university town rich in culture, with works by Giotto), Vicenza (architecture and the Palladio villas), Venice (cultural, political and moral capital of the Veneto region, as well as a spectacular place to visit), Rosolina Mare, Sottomarina, Jesolo, Caorle (sea and beach), Verona (Arena, Romeo and Juliette) and Lake Garda (beaches, surfing and amusement parks).